The Pisces July 2015 Horoscope foretells that you should use your charming personality to influence others to help achieve your targets. For the time being, forget about yourself and your abilities to be a winner. July 2015 for the Pisceans is a month of inner turmoil and personal challenges. Your inner desires and family issues will dictate the state of affairs this month. Career issues will not be that important. This is the time to be cheerful and enjoy life to the fullest. The more you enjoy, the more you will have the energy to accomplish things. You can also take a look at the 2015 Chinese zodiac forecasts for more predictions. If you are searching for a job in July 2015, you will be successful after 23rd. You should look for jobs which are closer to your heart. 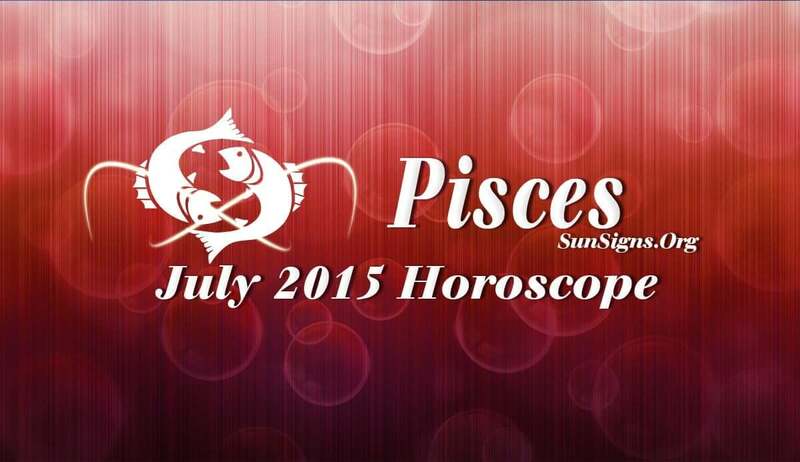 The monetary prospects are exceedingly bright till 23rd July 2015 for the Pisces zodiac sign. Your financial acumen will also be excellent. Month end will pose some challenges and you have to be cautious in your fiscal dealings. Earnings will be through your ingenuity. You will have the help of your spouse in making money. Singles will find their romantic lover in their boss. Engaged couples will be ready for marriage. Married people will have their second honeymoon this month. This is an excellent time to get pregnant. Compared to the last month, the health of the Fishes shows better signs in July 2015. You should take care of any problems that may arise promptly with immediate alternative healing therapies. Start enjoying life and spend time on some hobbies. This will enhance your mental fitness and is also an excellent home remedy for stress.